Brasov is located in the central part of Romania, about 166 km from Bucharest. It is surrounded by the Southern Carpathians, and is part of the Transylvania region. 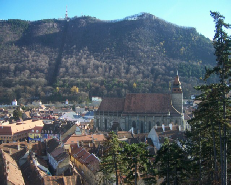 Brasov is one of the largest cities in Romania with a population of approx 280,000. There are basically 2 parts of Brasov; the pretty Saxon old town and its square situated beneath Mount Tampa and then the surrounding concrete jungles of tower blocks and factories. The old town is one of the best preserved old towns in Europe with splendid architecture and old fortifications and is well worth taking a few days to explore.The city has an amazing history with influences from Germany, the Austria-Hungarian Empire and the old communist state. The city was founded in 1211 by Teutonic Knights and was developed by the Saxons. The Saxons living in Brasov were mainly involved in trade and crafts. The location of the city at the intersection of trade routes linking the Ottoman Empire and Western Europe, together with certain tax exemptions, allowed Saxon merchants to obtain considerable wealth and exert a strong political influence. They contributed a great deal to the architectural flavour of the city. The Fortifications around the city were erected and continually expanded, with several towers maintained by different craftsmen's guilds, according to medieval custom. Part of the fortification ensemble was recently restored using UNESCO funds, and other projects are ongoing. At least two entrances to the city, Poarta Ecaterinei (or Ekaterinentor) and Poarta Schei are still in existence. The city center is marked by the mayor's former office building (Casa Sfatului) and the surrounding square (piaţa), which includes one of the oldest buildings in Braşov, the Hirscher Haus, owned by a wealthy merchant. Nearby is the "Black Church" (Biserica Neagră), which some claim to be the largest Gothic style church in South-Eastern Europe. 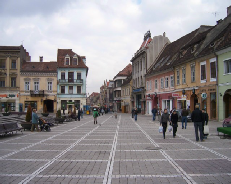 Brasov basically became a German colony and the Romanians were denied several privileges by the Saxon settlers. They were no longer recognized as citizens of the city, and as such they were no longer able to continue to practice their crafts and operate their businesses. Additionally, their primary religion (Orthodox) was not officially recognized throughout Transylvania, especially during and after the 15th century. The Romanians were not allowed to live in the city and they mainly lived in the Schei district, which is well worth a visit. To enter the city they would have to pay a tariff at one of the main gates which are still visible today. The town square is thriving with life during the summer with open markets and numerous restaurants scattered down the streets leading onto the square. The mountains and forests surrounding Brasov are bustling with wildlife including one of the largest populations of brown bears in Europe, wild cats and wolves. There is a large ski resort on the outskirts of Brasov and Bran castle home of the infamous Dracula is only 20 minutes away.